Shabnam Dadgar, MD (Mc Lean) - Book Appointment Online! 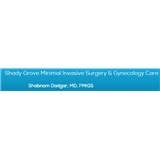 Welcome to our practice We are proud to provide a state-of-the-art facility for the highest quality minimally invasive surgery and gynecology care. It is one of our top priorities to protect the well-being of our valued patients. We are confident that you will feel right at home in our office as we welcome all patients as if they were family. One of the most important aspect of our practice is the mutual respect and positive interaction between the staff and our patients. Spending quality time with each patient is an integral part of your healing process.Dr. Dadgar and her staff are committed to providing our patients with the highest quality healthcare in a comfortable environment. We consider each patient as an unique individual and we specifically take into consideration our patient's preferences, values and cultural background.